The already long Nintendo Switch lines have gotten that much longer. Meaning? Things are suddenly more unpleasant for those wanting to buy a Switch. As Kotaku previously reported, the console has been drawing long lines for months afters its release, and well-known game creator Hideki Kamiya recounted his unsuccessful attempt at trying to buy one. While those were long lines, the most recent ones in Tokyo and Osaka are brutal. A massive line formed this morning at the Yodobashi Camera in Tokyo’s Akihabara. It was apparently over three thousand people long! The store only had 250 Nintendo Switch consoles! Remember, folks are lining up for a chance to buy. When game consoles are in short supply, Japanese retailers hold raffles. These are typically done in the morning, so while you probably don’t need to camp out overnight, you do need to get in line. People waiting get a number, there is a drawing and those with the winning numbers can buy the console. 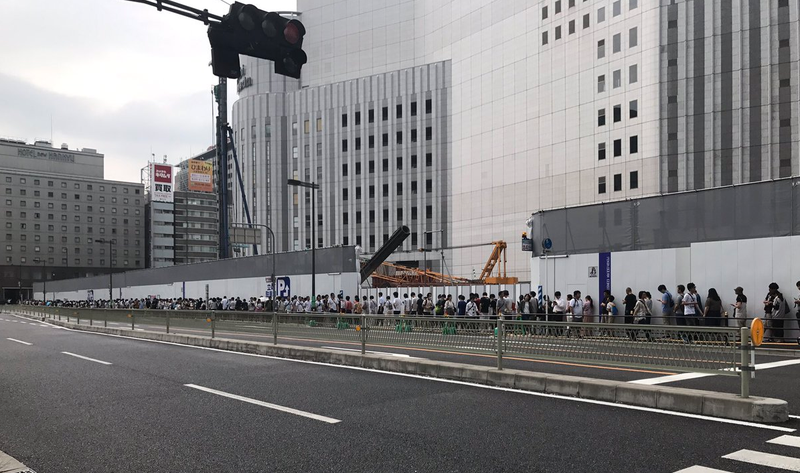 Summers are hot and humid in Japan, and here we have thousands of people waiting hours for a chance to spend money. If they don’t win, they’ll go home empty-handed and sweaty. Here is today’s Yodobashi Camera line in Akihabara. On Sunday, there was a similar raffle at the Yodobashi Camera in Osaka’s Umeda, which only had 200 Switch consoles. The line was reportedly 2,100 people long. And Splatoon 2 isn’t even out yet!